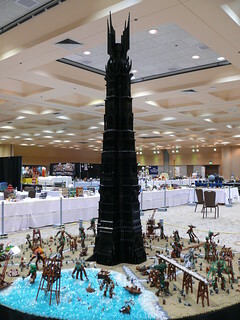 Our third annual Bricks by the Bay LEGO fan convention was a huge success! It was held just over a week ago, March 16-18, in Santa Clara, CA. Months of hard work planning and preparing for the convention finally paid off as over 400 attendees came to the convention, and over 5300 members of the public came to see our stuff on Sunday. I arrived at the hotel around noon and checked into my room. I had a van full of both my stuff, and stuff for the convention (mainly prizes). I sorted all my stuff from the convention stuff and had the bellhops take my stuff up to my room, and had the housemen (Banquet department workers) carry the convention stuff up to the suite. I then spent most of the afternoon in the suite along with the other board members Bruce and Loren, and our prize goddess Jen, getting things sorted and ready for the convention. I spent most of the time getting my Scrounge Build envelopes ready. When it came to be dinner time we went to the hotel restaurant and ate, then started setting up the Grand Ballroom. As the earlier event’s tables and chairs were being cleared away, we measured out on the floor all the locations where the vendor and exhibit tables would go and marked them with blue painter’s tape, and set up the pipe and drape in the vendor areas. In the meantime, the hotel staff brought in and set up all the tables in the spaces we had already marked. We stayed until about 1am working on this. I had to get up at 7am Friday to help continue setup. We had thought we would have a lot more table setup to do in the vendor areas Friday morning, but it turned out that we were able to get more done Thursday night than planned, so that was a more relaxing time than expected. I helped get the check-in desk squared away, and turned to setting up my MOCs. Unlike the past two years things were going quite smoothly and I didn’t get called upon much during this time, so I was able to have a fairly relaxing day almost like a regular attendee. At 1pm, I joined Mariann Asanuma to talk about SNOT (Studs Not On Top) building techniques, and used my camera connected to the projector to show close-ups of the things we were talking about. I brought my Kermit the Frog head to the panel, and showed the various ways that parts of his head were built at different angles. After that I sat in on Erik Wilson’s Historical Models presentation then took some alone time, catching up on email and decompressing. Later that afternoon I participated in the Adult Dirty Brickster (I brought a 9V train motor, and came away with a couple small Star Wars sets) and Small Set Parts Draft (I got a bunch of cool parts from the Olivia’s Tree House set) activities, then went out to dinner with the other Directors and the LEGO delegation. 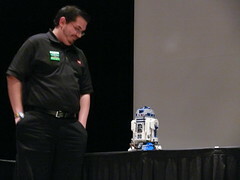 After dinner, we had the Opening Ceremony, where each of the LEGO representatives spoke for a while and then Kevin Hinkle from LEGO unveiled the new R2-D2 set. At the end of the Opening Ceremony I handed out envelopes for the Scrounge Build participants, consisting of a LEGO set instruction book and a form to fill out (but no parts – the point of the game is they have to find the parts, or suitable substitutes for a penalty, and build the set). A few minutes after that was done, a couple guys came up to me with a completed Scrounge Build model! It turned out that Angel Monje’s store had the model (a Star Wars ship) in stock, and they just bought it off him and brought it to me. But since they had to actually build the set to win, I told them to take it apart and rebuild it, and they still had to write out the story of how they got it, before they could turn it in. While they were working on that, there was a fire alarm in the hotel. Although we were in the Convention Center, a separate building connected by a corridor, we still evacuated the Grand Ballroom and spent some time waiting in the Convention Center lobby. I later learned that my Scrounge Build winning team had gone outdoors instead, and were working on their model in the rain! After they finally gave us the all clear to go back in to the ballroom, the team found me again and turned in their model. It seems that what they had bought was not built 100% right – there were pieces missing and extra parts that shouldn’t be there, so they had to do a bit more scrounging but eventually they got it done. With the story about finding the set and the fire alarm, they easily qualified as having a great story as well as being the first ones done, but since nobody else turned theirs in, they won in both categories. I took a lot of photos on Friday evening, but since some things didn’t arrive until Saturday that doesn’t cover everything. At 11, Jen Nogle and I ran the Relay Team Speed Build game, where 5 teams of 4 people raced to build a set that we provided. The parts from the set were distributed across three tables, where there was one station for each team, and the members of the team had to carry the build-in-progress from one table to the next, handing it off to the person who was waiting there, until a team finished the build. 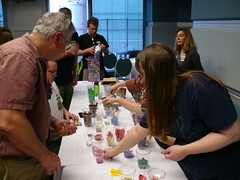 After lunch I was a part of the “How to Design MOCs from Start to Finish” panel with Mariann Asanuma and Russell Clark. We talked about three different ways of building: Mariann uses “brick paper” to plan out sculptures, Russell uses LEGO Digital Designer, and I build using bricks by looking at pictures but not doing any formal planning. I had some technical difficulties getting my part ready as I hadn’t taken the time to do adequate preparation, but in the end it worked out fine. Immediately following that was another game I was running: 101 Bricks. Players brought their own parts, 101 elements of any type, to engage in a series of challenges. My original idea, copied from the game I played at BrickCon last fall, was to go through 10 challenges, but because so many people were participating we only got through 5 of them. Still, it was a popular game and people had a lot of fun with it. That game ended at 3, when my dance partner Valerie came by after her bellydance class, and I spent the next hour showing her around. At 4, I was in another panel, this time on LDraw, with Jordan Ladd of BrickBooks. We talked about the various tools that make up the LDraw system and how we use them to make instructions for models. When that was over, it was time for the All Ages Dirty Brickster game. I brought in a box of LEGO 9V train track switch parts and came away with a Heroica game. What followed was the dinner break… and that’s where things finally came off the rails. First, Paul’s computer was misbehaving. He had to install some updates to the software and wasn’t able to create the slide deck during dinner as planned, and by the time the computer was ready to do so, it was almost time to start the evening ceremonies and he was needed on stage, so I took over that job. Second, I had failed to include space on the form for the builder’s names. Thankfully a couple of the judges did write the names down, but most didn’t, and I couldn’t very well give out awards without knowing who built the winning models! So I holed up in one of the empty rooms and furiously tabulated the votes with Loren, while tireless volunteer Raj Singh ran around the ballroom finding the winners and identifying the builders, communicating with us by cell phone. I don’t know how long this all took but it was probably over an hour. We were going to put photos on each slide, but quickly discarded that idea as too time-consuming, since it often wasn’t clear which photo corresponded to which winner. Meanwhile, back in the Theater, they had given out door prizes and awarded the winners for all the games, and needed to stall for time while I worked on the MOC awards. Eventually I got them done and ran triumphantly down the stairs in the theater with laptop held high to thunderous applause, and set it up on the stage for Paul to read off the winners. But as if that weren’t enough trouble for one night, I had been doing all of this with my laptop running on battery power, and the battery gave out just as we finished the awards. The computer put itself into emergency sleep mode and turned itself off moments after we were done with the slide show. But when I turned it back on the next day, I was horrified to learn that the file was corrupted and could not be restored, and I had never hit Save!!! So all the slides I had worked so hard on were lost, and I would have to reconstruct the winners yet again from the ballots. I did that on Monday at home after the convention, and think I got them all right except for a couple of unknowns…. The good news is I won some of the awards! 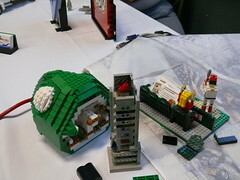 My “Rainbow Connection” sculpture of Kermit the frog with banjo won Supreme Sculptor (Art) and my “City Park” won Best Minifig Scene (Town & Train). 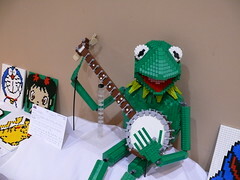 In the overall awards on Sunday, Kermit also won the “Greenest” trophy. I had brought the City Park to last year’s convention and it was barely noticed, but this year for some reason it attracted a lot of attention and I received a lot of comments about it. Kermit’s head appeared at the February BayLUG meeting (and won the “movies” themed contest there) but the rest of the body and banjo were built in the week before the convention. Anyway, back to Saturday night. After the ceremony was over, I ran the Wacky Racers and Catapult events. Wacky Racers was a hoot! We had a lot of entries in all categories (kids, teens, and adults) and some spectacular crashes as well as some great long distance results. The Catapult only had a couple of entries, all adult, and only one purist entry. Still, it was fun flinging minifigs across the lobby of the Convention Center! When that was all done, I stayed up late taking pictures of all the models until about 1am. We kicked everyone out of the ballroom at midnight, but I pulled rank to stay behind and take photos until the security guy needed to lock up. Sunday was our big day when the public would come through from 10am-4pm. Last year we hired a security firm, Praetorian Event & Protective Services, to monitor the doors and lines on public day, and this year we expanded that to include ticket sales as well. This saved us the hassle of having to provide volunteers for that work and just let the pros handle it. This proved to be a great decision and we will probably expand their presence again in the future. If you’re looking for a company to provide that kind of service I can’t recommend them highly enough. We had a long line of pre-paid people again this year, like last year, and we let them in as fast as we could… there were not many complaints, though at times we had to pause the lines because the ballroom was too full. I put up some signs to help direct the flow of people correctly, which helped avoid event staff people having to answer questions repeatedly and people being in the wrong line (cash vs. pre-paid). Like last year, the lines calmed down as the day wore on, since the majority of people came early. By the afternoon things were running smoothly without my help and I was able to go upstairs and participate in the Large Set Parts Draft where I got some great parts out of the Robber’s Hideout set. As that event wound down the convention center staff arrived to set up the chairs for the Closing Ceremony. We had the “chill space” bulk brick play area that was going on in room 203 moved out into the foyer, while we finished up the game in 204 and cleared out of there, and they took down the wall between the rooms and filled the space with chairs. Johannes set up the audio system and we were all set in time for the ceremonies at 4:30. At the closing ceremony we gave out a few more awards – the Wacky Racers and Catapult winners, Individual Speed Build, and other things that took place after the Award Ceremony on Saturday, the overall MOC awards, and two theme MOC trophies whose winners had been absent the night before. 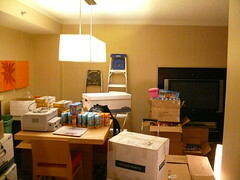 I announced the dates for the next event – August 8-11, 2013 – and we all went downstairs to tear down. A week after the convention, on Saturday March 24th, about 35 of us met at the International House of Pancakes for a post-mortem party, where we talked about the convention and what we all got out of it, started talking about the 2013 event, and I think BayLUG did some recruiting. It was fun to recapture some of the camaraderie from the convention if only for a few hours, but a challenging day for me as I came straight there from a tearful memorial service for a former housemate who had been a pillar of the social community I was a part of in college, who had died of cancer a week before the convention. We start the planning process for the 2013 convention, and we may have another smaller “minicon” this fall to tide us over since there’s such a long delay until the next event. We’re moving the convention to the summer because we weren’t able to find a date in the spring when the hotel could let us have the space. If you would like to join the effort, subscribe to our Planning Mailing List and you will be kept in the loop. Here are all my photos from the convention. Some photos appear in more than one set, so there are several ways to slice it up: by day, by subject, or All. Bricks by the Bay is less than a month away! 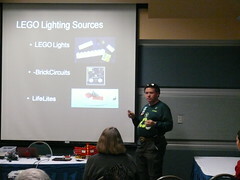 We just had another planning meeting today to go over the various things that need to be done for Bricks by the Bay 2012. Things are coming together, but there’s a lot more work to do. Registration is nearly sold out – as of this writing there are only 14 no badges left! Get ’em while they last! There is a waiting list, and you can always come to the public day. The 2012 Bricks by the Bay Convention registration is now open! If you’re interested in attending the whole convention, read all about the Convention, Hotel, Registration, and Schedule, along with more information about the weekend’s events. Not sure if you want to come to the convention or just the public day? Read our FAQ to find out more. Go to the hotel site and reserve your room if you’re staying at the hotel – $10 discount per room on convention fees. Go to our convention registration form and register for the con. If you’re bringing anything to display, we are using a wiki workspace to plan space for each theme. Request a wiki account and add what you are bringing to the appropriate wiki page(s). (Click the Edit tab at the top of the page you want to edit to get started). If you want to volunteer to help behind the scenes, subscribe to our planning mailing list. If you wish to be a vendor, first register for the convention, and then fill out out Vendor Registration form (everyone working your booth must be a registered attendee). A new interview I gave about Bricks by the Bay has been published on the KA-GO site. Just one week to go! Are you excited? Bricks by the Bay 2011 Registration now Open! 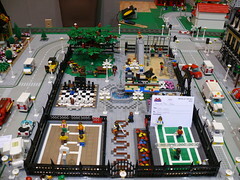 I’m happy to report that the registration form for the Bricks by the Bay 2011 LEGO convention is now available for general registration. I’ve been working hard with a team of volunteers (we can always use more help if you are interested) to get the convention organized and planned. So if you’ve been waiting for this news to register for the convention, your wait is over. Head on over to the site now and sign up! My Bricks by the Bay Pictures are available on Flickr if you want to take a look at some of the great models on display and the crowds on the public day. The convention was held Friday-Sunday, April 9-11, 2010 in Fremont. 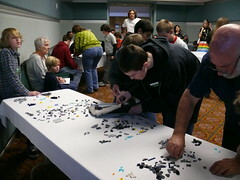 We had such great media coverage that throngs of people flocked to the hotel to see the LEGO models on Sunday, April 11. People waited for hours in a line that snaked out the lobby and through the parking garage and we had to turn people away once we realized the line was so long that people at the end might not get in before closing time. It was a huge success and we’re looking forward to having an even bigger and better convention in 2012. Click the image to see the pictures or view them as a slideshow. 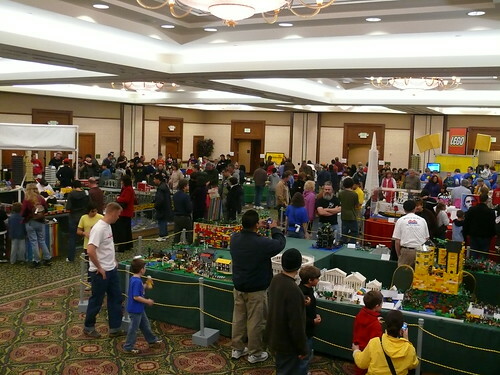 So, that was what it’s like to run a LEGO convention. I’m sitting in my hotel room, having just finished up the cleanup after the Bricks by the Bay LEGO convention. It was an amazing experience! The convention itself was so much fun and great to see so many of my ideas coming to life and actually working. We had nine themes, each with its own coordinator and judging categories, keynote speech by LEGO’s EVP-Marketing Mads Nipper, contests and games, and lots of door prizes. And though there were a couple times when I got really stressed out trying to make sure everything went off without a hitch, for the most part it was a seamless experience. The public day though, was a bit of a debacle. We had such great publicity that the turnout was tremendous. I was interviewed for television several times, and the people came out in droves. People stood in line for hours in the cold and rain and the ballroom was packed elbow-to-elbow so much that we had to stop letting people get in line at 1:30. We had a few irate people after that, but most people understood that even if they got to the head of the line, they wouldn’t be able to stay long since we had to close at 4. For the most part though, it went pretty well. We had a lot of positive comments and those who did get in seemed to have a great time. I just have to remember to not let a few bad apples spoil the barrel.